Often, individuals involved in conflict develop an "us" versus "them" thought process, which leads to the fundamental attribution error. The fundamental attribution error is a concept concerning one's attributes. Individuals effected often attribute their own behavior to situational causes, while attributing the behavior of others as a personality flaw.4 Corrymeela assists in allowing people to take a harder look at their actions first, before creating negative perceptions of others. The Corrymeela Community helps people see that their perceptions of others may not always be correct. This organization also uses the contact hypothesis, which is the idea that contact with members of the other group should reduce prejudice.5 Corrymeela includes this in their programs to help reduce tension and stereotypes about the other group, and they provide a neutral, peaceful oasis for discussions to be held and progress to be made. Participation is voluntary, staff supports the activities, and the groups are equal in status in the program in order to make the contact productive in disconfirming stereotypes. Doubling may have occurred for many individuals involved in the conflict. Two differing identities are created in extreme situations in order to justify actions in many situations while only being a single person.6 Corrymeela works to help individuals find their true identity and acknowledge it so they can understand others’ identities throughout the troubles. Individuals also need to understand their true identity to be able to begin truth telling. Lies have been told all too often in the case of the Northern Ireland conflict. 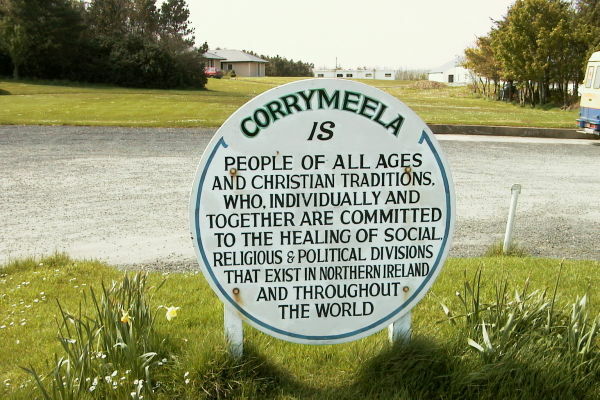 By giving people a safe place to tell their true stories, Corrymeela allows these individuals to have the confidence to tell the truth in front of the other side’s members. People want to justify their actions in troubling times, but many times this requires lying. Corrymeela’s efforts, along with many others’, are to move towards peace by finally interacting truthfully with other individuals by reducing lies and gaining openness. The project’s logo (to the left9) is an illustration of the ulex europaeus, also known as the whin, gorse, or furze. Rural community members have benefited from the plant by using it for cattle food, cleaning purposes, and dye for Easter eggs. This plant also acts as a welcome blanket after the bleak winter.10 This logo may be used to help show people that good can come after conflict and miserable times. Through truth telling, individuals are able to tell their stories and share their emotions and reactions about the events they experienced. With their stories, individuals have the opportunity to recognize and understand their perception of reality during the conflict and now. Sensory perception is most often used in everyday lives when everything is normal to them. By using this perception, they weigh the benefits and consequences before they act. People with a mythic perception do not think things through as they should; this usually happens during wartime.11 Those who share their stories can reflect on their perceptions and begin to understand why they used the mode they did. Many of the individuals we met with have been throught this process, and now find themselves in a much better place than they were during and directly following the height of the conflict. Alternatives to Violence is a volunteer group that offers experimental workshops in conflict resolution, responses to violence, and personal growth. Alternatives is an organization that helps others resolve issues through restortive justice. "Resortive justice is about bringing the offender back into the community" They help others confess what they did wrong instead of placing the blame on others. This helps bring about forgiveness between individuals who have long underlining issues. Alternatives also works with the youth in its surrounding areas to help stop the violence and the trouble making. Alternatives also helps with leaving violent institutions. Some members that were involved in paramilitary groups work with this organization to help assure that the violence of the troubles does not return to their community. They have left their violent institutions to help promote peace education and research in their community.